Wagner is without a doubt one of the most well-known composers in history. His “Ride of the Valkyries” is among the most impactful and recognizable pieces of music, used in many different settings and evocative of so many emotions. Those a bit more familiar with Wagner are also aware of his anti-Semitic leanings and the great enthusiasm Hitler had for his music. 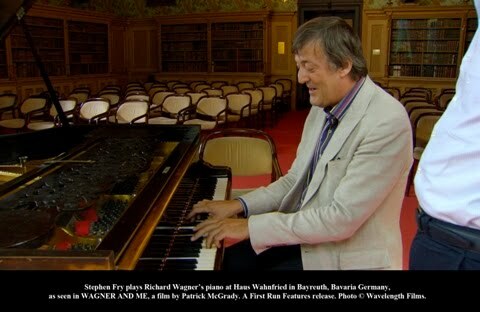 In “Wagner and Me,” British actor Stephen Fry, who is Jewish, sets out to try to reconcile his strong love for Wagner’s music and his brilliance with his very public feelings about Jews. This film’s title is accurate since it essentially involves Fry spending ninety minutes giving an extensive history of Wagner, describing his motivations and his process with admiration. His written tirade against the awful Jewish people comes up midway through the film, prompting Fry to step back momentarily from his excitement and to ponder how much meaning that should have for him. When he addresses how much Hitler loved Wagner, something for which Wagner should not bear all of the blame, Fry opts to interview a Holocaust survivor, to figure out just how much Hitler and Wagner have become intertwined in the societal consciousness of Europe. The caveat that dampens Fry’s affection for Wagner is ultimately inconsequential since it’s so clear from the star that he adores the composer, and therefore the film doesn’t accomplish what it sets out to in a fulfilling manner. Yet it does serve as a comprehensive and detailed biography, composed with great respect for a revered artist. It’s easy to watch Fry talk about Wagner on screen because he has such a passion for it, and making this movie seems to have allowed him to get closer than ever to where Wagner truly flourished. As documentaries go, “Wagner and Me” is an effective chronicle of one man’s life and the music that he created. Its tackling of its alleged subject matter, the difficulty of accepting Wagner in light of who he was, is less convincing, mainly because Fry is so in awe of the composer. Discussing Hitler’s use of Wagner’s music is somewhat more compelling, but this is really just a tribute to Wagner by one of his most devoted, and occasionally conflicted, fans.